The concept of spectral X-ray imaging – color X-ray imaging – is gaining interest for many applications. By using the spectral information in the X-ray beam more information can be extracted than using conventional imaging methods. The effect is similar to switching from black and white to color photos. Spectral X-ray imaging has been made possible by the rapid development in microelectronics. Modern detectors can process individual X-ray photons and determine their energy. Mid Sweden University has been active in this field for a long time and has a strong international position. In this project we intend to build on this position to develop new applications and create opportunities for regional industry to act as suppliers of radiation detectors for the international market. The demand for advanced radiation detectors will increase dramatically in the next few years. A number of large research institutes including CERN, GSI, ESRF, XFEL, ITER, JET, ESS and others are either being built or are planning for substantial upgrades before 2020. In addition the concept of quantum imaging is used for materials testing in industry and has gained interest from the medical imaging industry with an expected annual market exceeding 10 billion Euro. Mid Sweden University has a strong position in this field of research and is active in the leading international collaboration – the MEDIPIX collaboration coordinated by CERN. This project will strengthen the international presence of the region and opens up new opportunities for exploitation of results by the regional industry. The aim of this project is to stimulate international collaboration and exchange of knowledge between universities, regions and industry in the field of radiation detector. The project will create an international network of researchers and industries to work on a technology roadmap for the continued research on radiation detectors and to develop new applications based on radiation detectors with spectral capabilities. An extended international network with academic and industrial partners in the field of radiation detectors. A technology roadmap identifying the critical technologies that needs to be developed in the near future. A process for fabrication of radiation detectors in the cleanroom at Mid Sweden University. At least two new applications that can be exploited by regional industry. 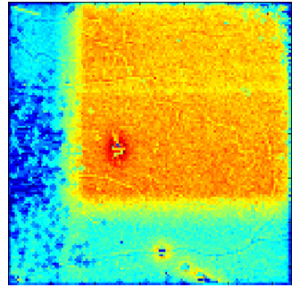 Material separation by spectroscopic imaging. Two sheets of different metals are placed on top of each other. The left image is taken using the full X-ray spectrum and the two metals can’t be distinguished. 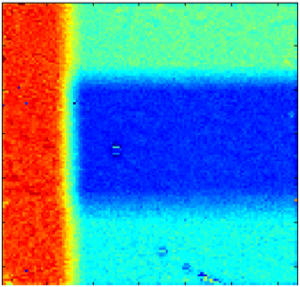 In the right images the two materials have been separated by the difference in their spectral response. (In these images the color is used for visibility and only indicates intensity). The images were taken using a CdTe sensor on a TIMEPIX readout chip. 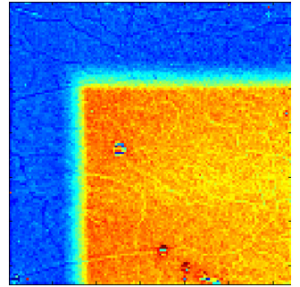 Some defects in the sensor are seen in the images.